About 10 days ago I wrote a post about leading cricketers of this century, which showed that Kumar Sangakkara was the top batsman in both tests and ODIs in the past 15 years of the game. No one has scored more runs than Sangakkara has in either format since the beginning of this millennium. Not Sachin, Not Lara, Not Ponting. No one. With his 10th double century in test cricket this past week, Sangakkara showed why he is the best batsman in the game today. No one in the history of test cricket has scored this many double centuries besides the all time great Sir Donald Bradman. Sangakkara sits firmly at number two in that list, and he may well go on to become the first cricketer to break Sir Don's record. At the conclusion of the first test between Sri Lanka and Pakistan, the ICC updated the test rankings for batsmen and Sangakkara rightfully found himself at the top of the pile. The number 1 ranked test batsman in the world, and surely the bets test batsman to play the game this century. 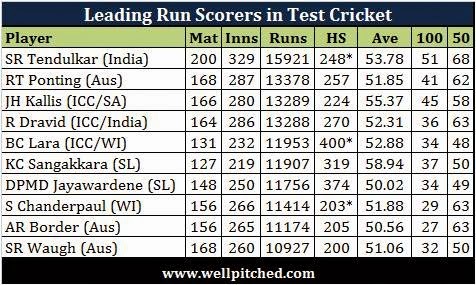 He may not end his career among the top 3 or 4 run scorers in test cricket, but he will definitely retire with the best test average, by some distance, among the top 10 run scorers in test cricket. And the best test average for anyone with more than 7,000 runs in test cricket. And the third best average for anyone who has scored more than 3,000 runs in test cricket. Sangakkara will surely go past Brian Lara in the next test against Pakistan, but whether he will be able to go past the next three in the list will depend on how long he continues to play test cricket. With Jayawardene gone after this series, it will not be much longer before Sangakkara also retires from test cricket. And there is enough hint around the Sri Lankan camp that both the stalwarts will end their careers after next year's ODI World Cup. If Sangakkara does decide to play another season or two, there is a high chance that he will retire as the second highest run scorer in test cricket, behind Sachin Tendulkar. The best batsman this century, and arguably the best batsman ever. Hail King Sanga!